SOS. At Queen campaign headquarters, Ollie and Thea are talking to their campaign advisor Alex about things (and why Felicity hasn’t shown up for this meeting), and Thea is trying to avoid Alex’s awkward offer for a date. Ollie heads to Palmer Tech to find (like Curtis does a few minutes earlier) Felicity has been there for several days deciphering and scrubbing that message from Ray. Oh yeah, that’s when Ollie learns Ray might be still alive. His advice for Felicity is to grab a few minutes to rest and shower, which she’s not really wanting to do, and before she can take that advice, she gets a notification about another signal from Ray. She and Ollie answer, and find Ray’s miniaturization experiment worked, but he finds himself now in a glass case in a laboratory somewhere. So, Ray has some schematics for an enlarging ray, which they need to assemble. There is one specific device they need that is exclusive to Kord Industries, so to avoid having to ask your biggest competitor for their super fancy exclusive device on a loan, Felicity thinks stealing it would do. Then, her mom shows up to brighten her spirits, which when realizing Ollie had something to do with this, does the opposite. Hey everyone! Welcome back the only other character in their 40’s that isn’t a villain or morally compromised! Late Night Shopping. 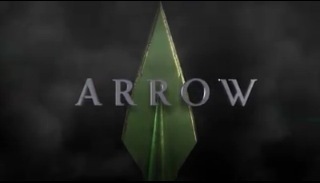 So, Team Arrow, and Sara back in her Canary garb, are sent to a Kord Industries building to steal that device. Besides Felicity grilling Ollie on her mom pressuring him into inviting her back to Star City, Sara’s in an odd place too, trying to suss out how to deal with being back from the dead. Well, that theft goes okay, baring Sara almost going crazy beating a security guard. And as Felicity tries to relax in Arrow HQ, Ray signals in again, and they both discover someone’s watching Ray’s interaction: his captor, Damien Darhk! Dinner Date. While Felicity is freaking out over Darhk holding Ray, Ollie suggests they both need a break and have dinner with Donna. Felicity really doesn’t want to waste time on a silly dinner, but considering how long it’ll take to get things ready and ask Quentin to get a lead on where Darhk is, she reluctantly agrees. Even before the dinner starts, Donna can smell there’s some trouble with both Ollie and Felicity and decides to excuse herself. Felicity tells Ollie she’s not angry with Ollie, but that her running off with Ollie kept her from discovering those early messages from Ray. She thinks Ollie’s a distraction for her which, is not entirely wrong, even if that realization comes from the wrong place. Meanwhile, Darhk really wants to know more about Ray’s miniaturization tech, and offers to help him return to normal size. Ray wisely declines that offer, and moreso when Darhk notes Felicity getting name dropped in his messages. Uh-oh. 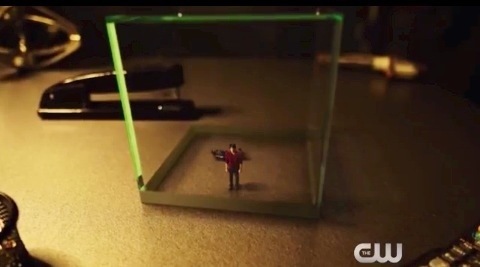 Get your own Ray Palmer in a Box for the holidays! Felicity gets rang in time for Quentin’s meeting with Darhk, where Quentin pitches he wants help in fixing Sara. What it really is is Diggle getting to trail Darhk to a building, one that is heavily protected from within. Ollie says Curtis will have to come along with them on the break-in to help rescue Ray, and Sara offers to come along to help. And despite what happened last time, Ollie accepts her help. Break-In For A Break Out. Outside Darhk’s building, Ollie’s scoping out the place…when he’s knocked out by a HIVE guard! Well, its supposed to be a HIVE guard, because once a chained Ollie is left with Darhk, that guard is revealed to be Diggle! He lets Laurel, Thea, and Sara inside the building, while Curtis takes Felicity via his para-sailing skills (and this is why you never surrender that kind of info to Felicity, because you have to parachute through a window because of it!) into an upper floor of the building. Diggle links up with Felicity and Curtis, and they find the lab where Ray is being held. Ollie almost gets his identity revealed to Darhk, but he escapes the evil blonde magic man. The ladies fight a lobby of bad guys, and they leave right around the time Sara goes nuts and kills one of the baddies. Felicity and Curtis manage to unshrink Ray and it seems Operation: Un-shrink Ray has been successful! Time to celebrate, except for that dead HIVE agent Sara neck snapped! Felicity’s had a rough episode. May I suggest some cordon bleu to ease the stress? Finding Yourselves. Ray gets to check out Arrow HQ, and is going to let Felicity run things at his company until he figures out how to break to the world that he’s back from the dead. Sara is pretty much leaving town to get herself in check instead of hanging with the Laurel/Thea support group, and who could blame her? Those two resurrected a dead person who became a soulless killer…oh, yeah. Nevermind. Meanwhile, Quentin ends up sharing an unexpected drink with…Donna? Ruh-roh. Thea decides to take Alex up on his date offer. And Felicity and Ollie patch things up, while Darhk looks at his secret box, which is a fold out schematic of…something. Yeah, that’s the episode, people. Well at least we won’t have to bring back that whole Diggle’s dead bro thing for a bit…(now watching promo for next week’s episode)…OH. Um…looking forward to that? –Comic book connections: So Ray Palmer shrank himself, which is of course a big power of his DCU persona of the Atom. –Really? Felicity just let her mom undercook that cordon bleu? I think she’s thinking under exhaustion and grumpiness to let that happen. –That moment when the rest of Team Arrow lets Felicity know they heard her rant about her mom and Ollie texting each other? Hilarious. –Felicity wanted to go to SpaceCamp SO BAD. Who can blame her? I wanted to go SpaceCamp as a kid!